Bitter melon is used for various stomach and intestinal disorders including gastrointestinal (GI) upset, ulcers, colitis, constipation, and intestinal worms. It is also used for diabetes, kidney stones, fever, a skin condition called psoriasis, and liverdisease; to start menstruation; and as supportive treatment for people with HIV/AIDS. Today’s research, however, emphasizes a different bitter melon benefit: The fruit helps to maintain blood sugar already within normal range. Intriguingly, this modern research-backed application is mirrored by tradition: Chinese wellness herbalists have used the bitter fruit to assist with blood sugar problems for centuries. This low-calorie vegetable also prompts the smooth digestion of food, helping to eliminate indigestion and constipation problems. One hundred grams of raw bitter melon pod gives approximately 84 milligrams of vitamin C, which is 140 percent of the recommended daily intake. Bitter melon is also a good source of Vitamin A and flavonoids such as beta carotene, lutein and zea-xanthin. 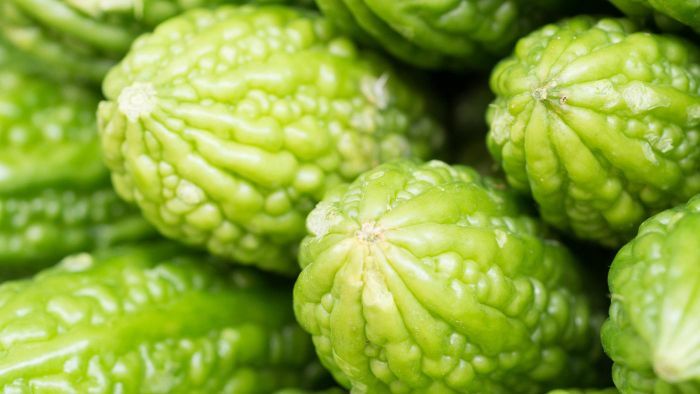 Bitter melon is suggested for menstrual stimulation, wound healing, inflammation and hypertension, states Total Health Magazine. The extract of bitter melon has good impact on the nitric oxide system of the human blood vessels, which is beneficial for overall cardiovascular health. Men who have erectile dysfunction may benefit from using Bitter Melon in their diet.